City Garden Montessori is one of a handful of diverse charter schools that have opened in the last decade, reducing the percentage of segregated charter schools in St. Louis. If you walk into most public schools in the city of St. Louis, you’d never know that five black parents won a federal desegregation lawsuit in 1975, or that years of appeals resulted in the creation of a much lauded voluntary intra-district transfer program in 1983. According to a St. Louis Public Radio analysis of state data, the percentage of racially segregated public schools in the city of St. Louis rose over the past 26 years, from 54 percent to 78 percent. Today, most of the students in the St. Louis public school district attend schools where all, or nearly all, of their classmates are African-American. Charter schools used to be even more segregated than the district. But, in recent years, a handful have succeeded in attracting both white and black families. The choices of past and current parents at City Garden Montessori, in the Botanical Heights neighborhood, illustrate how one charter school achieved integration, and the barriers to replicating that model. 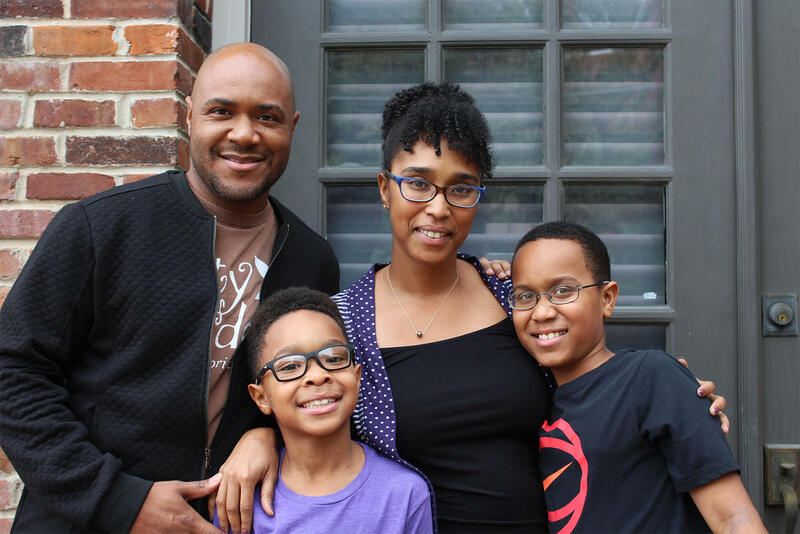 The Banks family sent their sons to City Garden Montessori in St. Louis' central corridor. 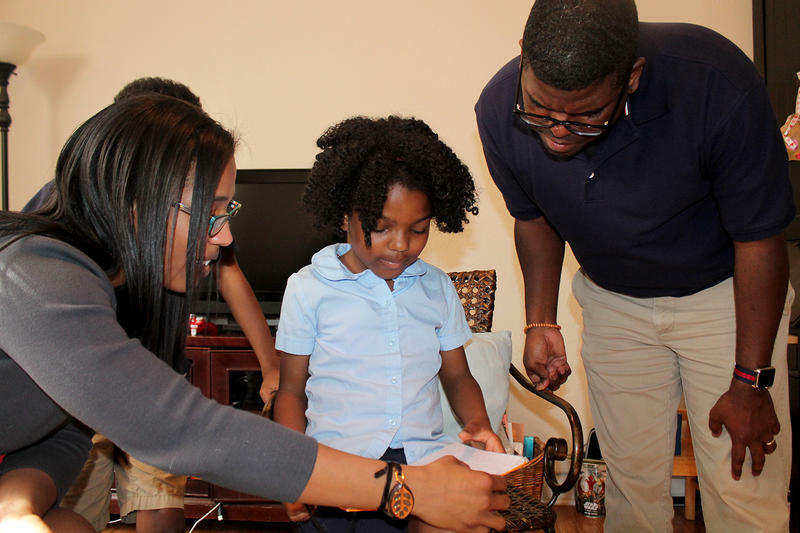 When her family moved to St. Louis in 2011, Kira Hudson Banks only looked at homes in the neighborhoods surrounding City Garden Montessori, just south of the city’s central corridor. “My husband kind of looked at me, like why are we only looking in this rectangle? But it was the Montessori, and the makeup, the demographics of the school,” said Hudson Banks, who is African-American. St. Louis Public Radio's Camille Phillips looks at how St. Louis Public Schools are becoming more segregated. At the time, about 40 percent of City Gardens’ students were black; the other 60 percent were white. 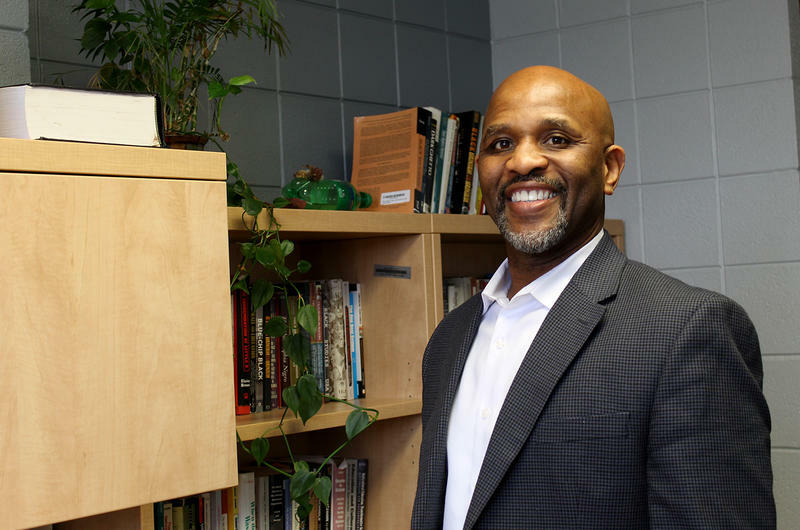 Hudson Banks is a Saint Louis University psychology professor who specializes in the effects of racial discrimination. She wanted her sons, Avery and August, to go to school with other black children without being segregated in an all-black school. City Garden, at 1618 Tower Grove Ave., is located in one of the parts of St. Louis where a pretty even mix of white and black people reside. Christie Huck, the school’s executive director, said the location was an intentional choice for the founding parents, including herself. As permitted by state law, students who live nearby are given priority in the charter school’s lottery. “Creating a racially and socio-economically integrated school was a core part of the mission from the very beginning. And not just diversity for diversity’s sake, but as a means to create equity,” Huck said. A large body of research shows that students do better when they attend schools with students from a diverse mix of economic and racial backgrounds. For instance, a 2016 report compiled by the U.S. Government Accountability Office found that black and Latino students are the most likely to attend both racially and economically segregated schools, and that percentage is increasing. According to the accountability office’s analysis of national studies, schools with high concentrations of students living in poverty tend to have substantially lower academic outcomes. And, according to a 2009 Stanford study, students fall further behind the longer they attend segregated schools. But integration is hard to achieve in St. Louis. In 2015, more than half of the white children living in the city did not attend either type of public school: the traditional school district or a charter school. Instead, they went to a private school or their parents taught them at home. White parents living in the city who decide to keep their kids in public school tend to choose charter schools. According to a St. Louis Public Radio analysis of building enrollment data, almost half of the white students enrolled in public schools in St. Louis attend charter schools — even though the district has twice as many students. State records count 2,714 students attending traditional schools as white. Charter schools have 2,229 white students. In 2017, SLPS had 21,754 students, compared to 10,979 in charter schools. A total of 18,881 students in the district's schools are non-white; 8,677 students in charter schools are non-white. Non-white students include those who are black, Hispanic, Asian, American Indian or multi-racial. Grace Hagen said she and her partner sent their daughter Mila Sweeny to City Garden because they wanted her to be around children from other backgrounds. Mila now goes to a private high school. Grace Hagen, who is white, said she and her partner sent their daughter Mila Sweeny to City Garden because they wanted her to be around children from other backgrounds. “There’s a lot of unlearning that we’ve had to about dominant culture and our own biases and privileges and don’t want that for Mila if it can be headed off earlier or avoided,” Hagen said. City Garden is one of several charter schools that opened in the city’s less segregated central corridor after the state took over St. Louis Public Schools in 2007. With more options to choose from, white families fled the district in large numbers. By the spring of 2017, almost 80 percent of the district’s schools were racially segregated, with at least three out of four students identifying as black, Latino or Asian. Many of the district’s schools are more than 95 percent African American. That doesn’t surprise Superintendent Kelvin Adams, but it does concern him. “It’s a school issue, but it’s also a community issue that has to be addressed by everybody, not just us, meaning the school district. Our school is open to everybody. Selling those schools to families is a real challenge,” Adams said. St. Louis Public Schools was reclassified as fully accredited by the state board of education in January after meeting the state’s academic benchmarks. But a state-appointed board still runs the district. Even though there are more integrated charter schools than district schools, most charter schools in St. Louis are still segregated. That influenced Hagen’s choice of a high school for Mila. Hagen said she enrolled her daughter in a diverse private school, Crossroads College Prep. According to information the private school provided St. Louis Magazine, about 45 percent of Crossroads’ students are minorities. But the choice bothers Hagen, because she knows not every family has the money to do the same. They considered the highly selective magnet school Metro, one of the district’s few diverse schools. But Hagen and her daughter decided a slightly less rigorous school was a better fit. Mila said she’s found her freshmen year at Crossroads “challenging but not too challenging,” and she likes the school’s theater program. Families that can afford to avoid public school have been doing so for decades. Meanwhile, more than 80 percent of St. Louis Public Schools’ students live in poverty, and it’s been that way since at least 1991. Adams said that’s a loss for the entire city. A researcher with the Economic Policy Institute says the federal government needs to recognize that it played a deliberate role in creating racially segregated neighborhoods in cities like St. Louis. 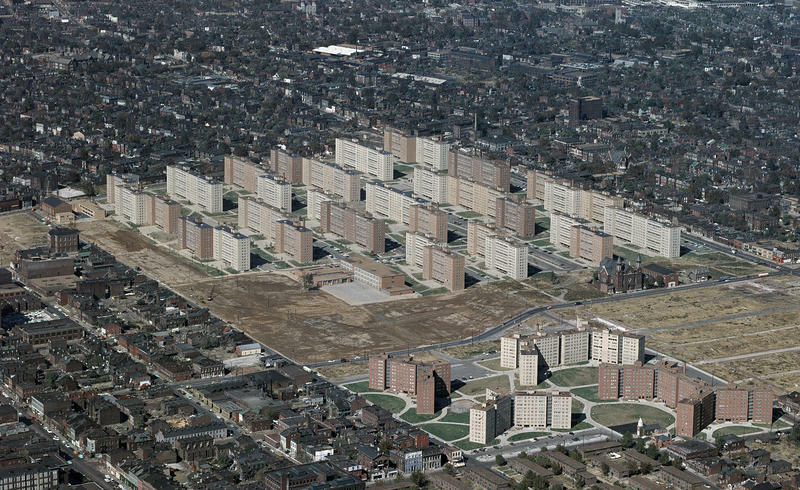 At a Missouri History Museum Symposium Saturday, the think tank’s Richard Rothstein drew a direct line between today’s segregated schools and neighborhoods and two federal housing programs from the 1930s, 40s and 50s: public housing and subsidized construction. With St. Louis’ voluntary desegregation program on its final extension, University of Missouri-St. Louis education professor Jerome Morris has been asked to recommend the best way for the region to continue fulfilling the promises of Brown vs. Board of Education. To fulfill that task, Morris is first researching how well the program has done in the past. As President Donald Trump’s administration explores ways to expand charter schools across the country, parents in national surveys and those in St. Louis point to academic quality as their highest priority in selecting a school. Research suggests that parents often don’t have a way to accurately compare the public education options. And there are several factors that parents take into account — including word-of-mouth and proximity to one’s home — though more often than not, they choose a charter school or district school based on their child’s current and future success instead of the school’s overall performance.